Martin Kuentz, born 1975, is a Berlin based freelance artist. In 2002, he founded the Salon Bruit, a concert series on improvised, electroacoustic and noise music. He organized the DIENSTbar event on M.S. Stubnitz (Rotterdam) in 2001, and took part in the “White Ears” exhibition of Expo 3000 (Lagos Art Festival). Music related projects include radio transmitting performances as Transmitting Object Behaviour (T.O.B. ), Berlin free radio campaign, Blind Operators, Unkuentz vs. Trodza. Co-founded ‘apostrov recordings. Various concerts in Germany, Denmark, England, Romania. 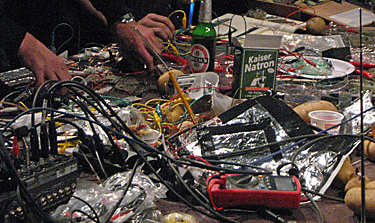 Martin Kuentz does several workshops for DIY mikro-fm-circuits and DIY sound-modules in Europe.